Motorcycle riding is both a hobby and a passion for many Californians. Riders enjoy temperate weather allowing them to ride for both recreation and transportation for much of the year. This also means that the danger of motorcycle accidents is a year-round reality. Even riders who know the importance of safety can find that a ride can turn from fun to tragic in mere moments. Our San Francisco motorcycle accident law firm has experience representing seriously injured riders as well as the families of those who lose their lives in motorcycle crashes. A report in the San Francisco Chronicle gives a glimpse into the terrifying crash that claimed the life of a California Highway Patrol officer last Friday. The officer, who served Solano County, was riding westbound on an area of Highway 12 known for being a hazardous stretch of road. Shortly before 6 P.M., a Toyota truck travelling eastbound made a left turn towards a driveway near Red Top Road. As the driver crossed the first westbound lane and began to enter the second, he spotted the oncoming motorcycle. According to the driver, he tried to accelerate to get out of the way but was unable to do so in time. 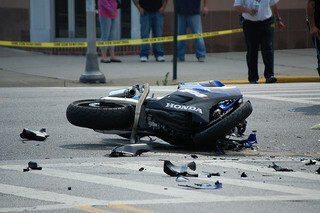 The motorcycle clipped the rear of the Toyota, causing the rider to be ejected from the bike. As the first collision occurred, a Honda CRV sports utility vehicle travelling eastbound approached the location. The oncoming driver saw two “unknown objects” moving rapidly towards him. He missed the first, the motorcycle itself, but was unable to avoid the second and the rider struck the SUV. Moments after the crash, a doctor from Napa State Hospital (possibly a passerby) began to attempt CPR on the motorcycle rider. However, the efforts were futile and paramedics pronounced the driver dead shortly after they arrived at the accident site. CHP investigators are still examining the incident and they have not yet determined a cause. No one else suffered injuries in the crash. The fact that Friday’s accident left the rider dead but the drivers uninjured is not unusual. Simply put, motorcycles are more risky than passenger vehicles. In fact, the Center for Disease Control (“CDC”) found that deaths involving cars and light trucks fell to an all-time low in 2008 while motorcycle deaths rose to an all-time high. Statistics reported on the CDC’s Motorcycle Crash Related Data website, show the number of motorcycle accident fatalities more than doubled between 1999 and 2008. Two disturbing figures – Between 2001 and 2008, more than 34,000 riders died in motorcycle crashes and an estimated 1,222,000 riders required emergency room treatment for non-fatal injuries in the U.S.
Motorcycle accidents often lead to tragic results, leaving a rider with serious, long-term injuries or leaving a family grieving a lost loved one. As a San Francisco motorcycle accident lawyer, Attorney Brod understands the impact these tragedies have on the rider and the rider’s family. His experience allows him to understand the many challenges these victims face and the very real financial costs that exist along with the mental, emotional, and physical consequences of a crash. Where the accident stemmed from someone else’s negligence, whether it was due to a neglectful driver, a faulty part, or some other failure, we can help. Attorney Brod represents seriously injured riders and their families, in injury cases and wrongful death suits, and helps them seek money damages that are essential to moving forward from a catastrophic collision.